Six months after their wedding, Mike Tan announces that he and his non-showbiz wife are expecting. Mike Tan, 31, has just announced on his social media accounts that he and his wife are expecting. 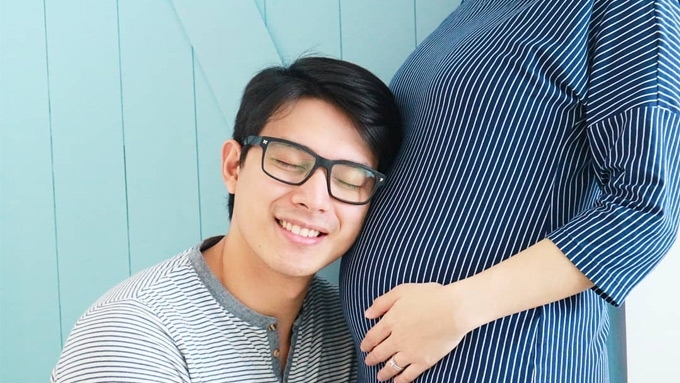 The Kapuso actor posts a photo showing his non-showbiz wife's baby bump, and captions, "Children are a gift from the Lord; they are a reward from Him." --Psalm 127:3 (NLT)"
His fellow celebrities quickly extend their congratulations. Marco Alcaraz comments, "oh! congrats!! welcome to the club"
Chynna Ortaleza is "happy" for him, while Yasmien Kurdi uses three heart emojis. Meanwhile, Dianne Medina gives a short side story, "Kaya pala when someone asked dun sa ig story kung gusto mo na magka-baby, soon ang sagot mo. Haha kasi soon naman talaga. Welcome to parenthood! @imiketan"
READY TO BECOME A DADDY. In a previous interview, Mike told PEP.ph (Philippine Entertainment Portal) that he's ready to start his own family. "Siguro sa tagal namin, matagal ko na rin siyang pinaghahandaan. "Kasi ang gusto ko sa amin, bago ko gawin, gusto ko handa ako. "Sabi ko nga, physically, mentally, spiritually matured ako, at kaya ko nang tanggapin lahat ng responsibilities na darating sa buhay namin. "Kung mabuntis man siya, handa rin ako, especially financially." Mike and his wife tied the knot at Villa Milagros ancestral house in Rodriguez, Rizal, last January 22, 2018. A month after their wedding, Mike then said he wanted to have a baby right away. "Nasa proseso po. Well, as much as possible, hindi naman na kami ganun kabata. "So, kung kaya, kung ibibigay na agad ni God, tatanggapin namin." The couple were boyfriend and girlfriend for 12 years before getting engaged on July 8, 2017. He recently recounted the moment, "...after receiving approval from her parents, I asked my now wife to marry me. After she said yes, our friends noticed that there was a rainbow in the background so they immediately took a photo of that moment. "I've always known that she was God's best choice for me but having that seal of approval in the sky was more than enough validation from God."